House Sharing Tips Part 2: upset neighbours can make sharing a home hard and there is nothing worse than living with someone who keeps upsetting your neighbours. You need to consider who you share your house with carefully as, while a harmonious share can work brilliantly, choosing the wrong person could be, to put it mildly, a challenge! And with house sharing being the only financially feasible way to buy a home for first time buyers, choosing the right partner is critical. This could be the same decision for any of the government parties that don't win with a majority vote - the leading party will need to choose who to share their House / Government with in a coalition. With most experts thinking No 10 Downing Street will be 'shared' between at least two parties, the likelihood will be someone will be choosing who to share with very carefully. A key factor in the previous Coalition government's sharing was the agreement both parties hammered out before they started governing. This is equally applicable to anyone looking to share a house. After carefully vetting potential co-sharers, having a legally binding agreement in place is great for deciding how a share will be conducted and giving security against the unexpected; especially if the person you share with upsets the neighbours or does something to breach the agreement. How do I pick someone to share a house with? You will most likely be looking to pick a partner, members of your family, friends, flat mates, or you can join Share a Mortgage - our platform is devoted to helping you find someone who is a good match for you. Do you want to live in a party house or a chill out home? Do you want to live together for the same period of time? 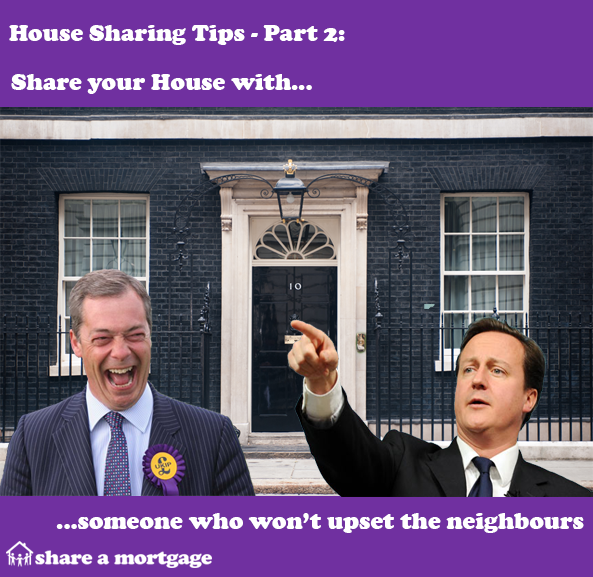 What if a sharer does upset the neighbours? The political parties competing for the keys of No 10 also have to imagine similar scenarios to work out which potential sharers might upset the neighbours to the left and to the right. The wrong choice might mean upsetting the apple cart and here, the apple cart involves their own party, other potential political allies, government itself and, of course, the electorate. Having strategies in place to combat these eventualities is critical. The best approach is to have pre-agreed rules and guidelines in place; if they are legally-binding, this adds more security. Things should work harmoniously but if they don't, there must be sanctions and ways of exiting for the protection of all sharers' interests. The more these things are established prior to moving in, the better the chances of a positive result. If a potential sharer likes playing industrial strength heavy metal at jet engine volumes at 3 in the morning, it's worth finding this out and either passing over that sharer or, at least, getting them to agree to curtail the practice. Otherwise your neighbours might regard the activity as a declaration of war! Can I get house rules and related matters legally agreed before a house share starts? Yes you can. Cohabitation agreements for married couples and civil partners are getting more and more press in the UK these days but the principles are equally applicable in house sharing situations where you are not cohabiting with other sharers. You agree any house rules - and what happens if these are broken - with the other sharers. You can also agree, for example, how long a house share will last, bearing in mind that it does not need to last forever. You agree how sharers can leave if they need to. Shared ownership protection also centres on a Declaration of Trust. This critically sets down how each person's individual share is calculated, centring on deposit and monthly mortgage repayment contributions. All sharers benefit from knowing that they have a fair share in a property which is legally protected. Shared ownership protection also allows for many variations, recognising the many types of sharing arrangements which are possible. An unmarried couple, for example, may have a very different outlook to three non-cohabiting work friends living together. In all cases, the point is to give as much surety that a share will fulfill its purpose, saving money on rent, sharing - and therefore diminishing - all housing costs and ultimately giving equity to each sharer.